In today’s day and age, there is so much one can do with their hair. Dare to explore a variety of styles and enjoy the freedom to shape your tresses the way you want. A blowout is not your at-home blow dry, it is a more thorough blow dry intended to give a smooth look with lots of volume. What this means is that after the hair has been thoroughly washed and towel dried, the hair is taken into small sections and products designed to smooth and give the hair volume are then applied, before a special blow dryer and large round brush are introduced. Throw in a flat-iron and curlers, and you will be sure to leave with the smoothest, shiniest, most voluminous hair. With an updo, the hair is swept up and fastened away from the face and neck, though some like to incorporate bangs or wisps that frame the face. Options range from the classic, sleek ponytail or bun, to updo’s that are more intricate and involve braiding or hair extensions. Just like it sounds, thermal styling involves the use of hot tools, including curling irons and flat irons, to style hair. Go sleek and straight, wavy, or get the bouncy curls you’ve always wanted. 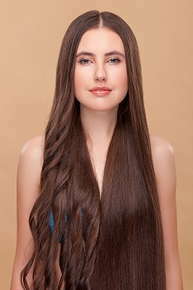 If your hair is thin, or even if you just want extra volume, extensions using real human hair are available. They are also used by those who are looking to completely change the look and texture of their hair. With a full head of extensions (often sewn into braided sections or glued/bonded to small sections of hair), one can really change the overall impact of their tresses. Hair can be clipped in, glued in, sewn in, taped, or microbeaded. Don’t worry, the hair is processed, going through a stringent cleansing and treatment process before it is weft and packaged. Whatever your hair style needs are, we are happy to help you achieve your aesthetic goals. Call us today to schedule an appointment.